This is an historic moment, with Trump in the White House and Britain moving toward a no-deal Brexit. So a LOT of people are country shopping. At the same time, Europe is in the midst of an economic boom, and there’s a war for talent that has companies scouring the globe for highly skilled internationals. So, we’ve decided to expand our lists of best cities for English-speaking expats to best countries for English-speaking expats. We know from personal experience that not everyone can afford Berlin, Amsterdam or Paris. Each of the European Union’s 27 countries has more than one attractive destination, so we’re looking at this global shift holistically: Where can expats make money in a booming economy, yet still enjoy a high standard of living? First, let’s look at where not to go. Much like the Nazis in the early 1930s, the Far Right – aided and abetted by American Steve Bannon and Russian President Vladimir Putin – are sowing ultra-nationalist discontent across Europe from Hungary to Sweden, working to destroy the EU and overthrow liberal democracies. Hungary is off our list because its authoritarian president openly embraces antisemitism. Poland has swung right with a vengeance. Last month, the far-right Sweden Democrats didn’t receive the support polls predicted. But Sweden is one of the most expensive countries in Europe, and Stockholm has a massive housing shortage. Austria and Italy already have right-wing coalitions, though Austria, in particular, remains steadfast in its support for the EU. There are countries that don’t make the list for various reasons including cost-of-living (Switzerland and Luxembourg). Language is also a barrier for English-speaking expats. The Nordics are booming and they welcome Americans. But most employers require fluency in the local language. The exception is the startup and tech industries. You could theoretically work for, say, Supercell in Helsinki. Their jobs don’t typically require Finnish fluency because they’re a global business and they need programmers and developers who speak Java and Python, not Suomi. Other lists rank countries based on surveys, scenery and whatever because they’re fantasy lists. But our Dispatches audience is different. Dispatches’ readership really is DIY expats, like us, or executives relocating with multinationals. We’re assuming for practicality’s sake that you are not a trust fund baby and aren’t moving to Europe to be closer to the Ferrari factory. We’re using practical metrics such as ease of immigration and pervasiveness of English in business so you can advance your career or build your business. We’re using our HQ country as the baseline for expenses because we’ve found it’s in the center of the expense spectrum between the Denmarks and the Macedonias. We’re also using NUMBEO and other data-aggregation sites for direct comparisons. Changing countries is a major undertaking whether you consider yourself an economic migrant, highly skilled international or just an expat with the adventure gene. Before European countries will welcome non-EU citizens with open arms, aspiring expats have to prove they either have resources to support themselves or a job and preferably both. If you’re starting a company, you have to put up thousands of euros in most countries to get a long-term visa. That’s what we did. That’s the bottom line whether you’re talking about the Netherlands, Switzerland, Italy or Portugal. Now, there are lots of new options … as long as you have the doe-re-mi. 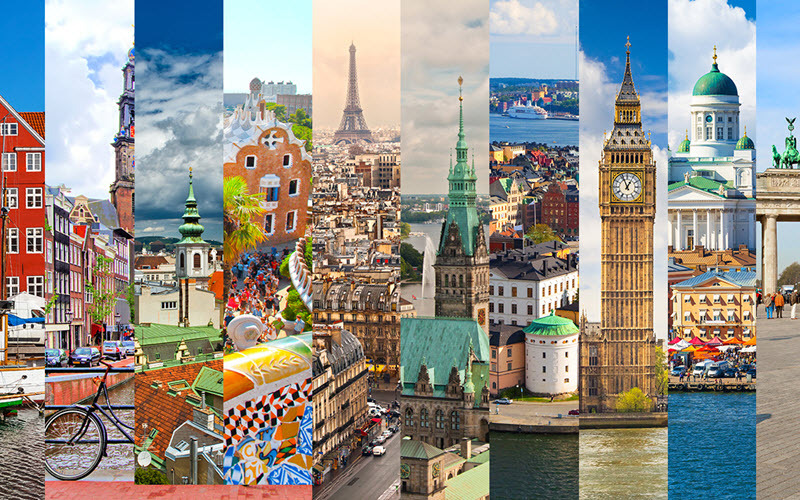 To get you started with that exploratory trip, here are the rules for coming to Europe and visiting countries in the Schengen area. It was only a few years ago we were exploring France, thinking we’d start Dispatches Media there. We came away underwhelmed. Lots of bureaucracy, pretty much no startup scene and no one spoke English. With the advent of Station F, Europe’s largest startup center, Paris is now a rival with Stockholm, Berlin and Amsterdam. France now has a fast-track startup visa program for founders, talent and investors. There’s even École 42, a free and open school where kids can teach themselves to code. Paris Mayor Anne Hidalgo says entrepreneurs are welcome and should think of her city as “a living lab” where companies can try out new ideas. Risk-capital investment in France is No. 2 in Europe, only behind the UK. But there’s more than that – France has the same sort of youth migration to the cities that every country has, leaving rural areas talent-starved, with plunging real estate prices and rents. Which opens the doors to the creative class, foreign and domestic. The cost of living is similar to the Netherlands, with rents (outside of Paris and Lyon) generally cheaper. Gas is less expensive in France, but food is generally more expensive. Overall, it’s probably a wash.
France is ranked No. 23 by Transparency International, just behind Estonia. Like other advanced economies, France has stellar universities including the Sorbonne. But until recently, those schools offered few courses in English. Paris has a number of the most elite international schools in Europe including American School of Paris. It’s traditionally been more difficult to get a long-term residence visa in France than in the Netherlands and other EU countries, with more language requirements and bureaucracy. But that’s changing. Since the 13 Nov. 2015 attacks, France has had a difficult time with terrorism including the 2016 Nice attack. Day-to-day, the crime rate is relatively low (compared to the U.S. and U.K.) outside Paris, but substantially higher than our benchmark Netherlands. Marseille, Paris, Toulouse and Lyon have the highest crime rates. Petty crimes and robberies are the most common crimes. Here’s advice from the U.S. Embassy. France is famous (infamous) for high taxes, and back in 2012, former President François Hollande raised the top tax bracket to 75 percent on people earning $1 million or more in annual income. Yikes! That was gone within two years. Now President Emmanuel Macron wants to cut the tax burden further on businesses and households, basically taking France back to pre-Hollande tax rates. Percentage English speakers: About 40 percent, according to Eurobarometer. Fun fact: Estonia’s land mass is slightly larger than the Netherlands, but it has seven percent of the Netherland’s population – 1.3 million versus 17 million-plus. Which means they need people. Lots of talented people, because this is the country that gave the world the engineers and developers who helped create TransferWise, Skype and other Unicorns. Now a not-so-fun fact: Latvia is an “emigrant country,” with more people leaving than arriving. And that’s been mostly educated young people going off to work at startup and tech companies in other countries. So it’s not surprising there is an active effort to attract highly skilled internationals. In fact, a big portion of the Invest in Estonia website is dedicated to recruiting software developers, cybersecurity experts and people with skills in cutting-edge industries such as mechatronics/embedded software. This summer, Estonia announced plans to create a digital-nomad visa, so yeah, they’re serious about attracting smart, mostly young people. Estonia is racing to be the most digital country in the world, with online banking, e-school, digital prescriptions and smart public services. You can see the requirements for a long-term visa here, which you can only get at an embassy or in Estonia. You don’t need a long-term visa if you’re an 18-to-30-year-old Canadian, Australian or Kiwi coming on a working holiday. You can stay for a year. In November 2016, the parliament passed a law to encourage young startups to set up shop there. The new tax system effectively doubles any money invested by venture capitalists. Estonia is not a Scandinavian country, but one of the three Baltics along with Latvia and Lithuania. Tallinn is at roughly the same north latitude as Stockholm and Oslo, and just south of Helsinki. So, summer comes on a Tuesday. This is a small, geographically challenged country and its longest border is with Russia. There is a ferry from Tallinn to Helsinki when you need a change of scenery. Otherwise, it’s a long damn drive to anywhere glossy unless you’re a big fan of Minsk. Most data sites rank the cost of living in Estonia in aggregate (housing and consumer prices) as at least 35-percent less expensive than the Netherlands. Similar to the Netherlands, if not easier. Foreign nationals can obtain Estonian residency by investing in, purchasing, or registering a new company in Estonia or opening a business. Ranked No. 22 in the world by Transparency International. Estonia just keeps pumping out winning tech teams. Taxify is the latest. The taxi-hailing app just sold Chinese investors a minority share. There are literally dozens of promising companies expanding to larger markets. The tax rate on capital retained or reinvested in Estonia is – tah-dah – 0 percent. Oh, and everyone else plays a flat tax of 20 percent! Violent crime is relatively low. There was something like 67 murders in the whole country in 2017. But petty crime can be a problem. There’s also a Russian-controlled mob in Estonia that controls prostitution, car theft and drugs. Percentage of English speakers: About 38 percent, though most people in Tallinn speak English along with Russian. We know lots and lots of people who live in, or have lived in, Germany. The majority are part of the U.S. military community. For these lucky Americans under the Status of Forces Agreement, the German bureaucracy rarely intrudes. Circa 2015, we toured Berlin, Frankfurt and Kaiserslautern to see if Germany was where we should start Dispatches Media. It wasn’t because it was too expensive. But we know so many American and British expats who’ve pulled it off, so this is doable. If you’re an entrepreneur like us, it’s tough to start a business in Germany. Even our expats in Düsseldorf tell it’s really, really difficult to work with Germany companies unless you’re totally fluent in German, and we’re not. But the opportunities to work for tech companies or join startups balances that out. Germany makes the list for four reasons: First, it’s the largest economy in Europe. Second, Berlin. We really loved Berlin, and we’re not alone. Third, universities are essentially free here and there are a growing number with English-language courses. And fourth is Munich is a tech and innovation center, creating lots of opportunities for startups. Germany is an excellent choice for English-speaking expats. Germans all learn English as a second language in school and most speak it quite fluently. You’ll find English-language translations of tourist pamphlets, advertisements, and important information, especially if you’re living near a large city. This makes for an easier transition language-wise. German culture isn’t a mile away from life back home in the UK. So once you’ve managed to get to grips with the German language (good luck with that), you’re not in for any major culture shocks. And luckily for us, it is relatively easy to get by in large cities speaking mostly English. The weather, whilst admittedly unpredictable in parts of the country, is at least predictably better than in the UK. Germany is ranked just below the Scandinavian Countries, Switzerland and the Netherlands, according to Transparency International. Germany tops the Netherlands because almost everything is less expensive from gasoline to restaurants. We would say in aggregate, just crossing the border into Germany from the Netherlands is an instant 20-percent discount on everything. But housing is increasingly expensive in Berlin, Frankfurt and Munich, though Germany has more housing than, say, the Netherlands, according to our expats who’ve lived both places. Germany has some of the best universities in the world including the University of Heidelberg, Humboldt in Berlin and Technical University of Munich. And they’re basically free. Berlin and Frankfurt have some very good, and very expensive, international schools. Similar to the Netherlands in that the bureaucracy is transparent and straightforward. The difference is, everything has to be done in German. Everything … twice. Germany, like all EU countries, has a progressive tax rate. The top tax rate of 45 percent is lower than the Netherlands. Percentage of English speakers: About 58 percent overall. But most Germans in large cities speak English. Portugal makes the list because it’s beautiful and warm. It has a growing economy with an amazing tech scene. And in global terms, Portugal is still a reasonably affordable place to live with incredible travel opportunities. In fact, it could be No. 1. It’s not because all of the Portuguese natives in our network think Portugal is in the midst of a real estate bubble. That and the Lisbon tech scene is developing, but basically creating talent for other innovation centers. Right now, tourism is driving the economy, which is nice, but not sustainable. All that said, a LOT is going on. In 2015, Lisbon became the first city to receive the European Entrepreneurial Region award. Investors from across Europe have discovered Lisbon, its (for now) low rents and increasingly in-demand IT talent. As we reported in April, Lisbon officials are planning to build Beato Creative Hub, serving notice to Paris and Station F that Portugal is the future of digital Europe. Hub Criativo Beato is almost the same size – 35,000 meters square – as Station F. But the Portuguese plan to punch it out to 100,000 meters square, or 1.1 million square feet, spread out among 20 buildings. Tenants include Mercedes-Benz. Those in our network who do business there are in awe of the opportunities and levels of economic activity right now. So, how hard is it to move to Portugal? Portugal has lot of ways you can settle there from startup visas to Golden Visas. The negatives: Unlike the Netherlands or Germany, Portugal has two cities of any size, Lisbon and Porto. Unless you’re coming to work in the leisure industry, start a winery or lie in the sun while you count your money, there are limited opportunities outside these population centers. Yeah, Portugal is that much cheaper. Basically, rents are half the rate of cities such as Amsterdam and Paris. Portugal doesn’t have the academic firepower of Germany, the Netherlands or France. The University of Porto is the highest ranked on the various rankings such as Times Higher Education. BUT, Portugal has a number of outstanding international schools. Portugal gets a high ranking mainly because of its Golden Visa program. This is the most popular Golden Visa in Europe. Between 2013 and 2017, investors obtained more than 5,000 Portuguese residence permits. Otherwise, it’s comparable to other EU countries in that you can get a long-term visa if you have an employer, are starting a business or marry a native. But you have to apply BEFORE you enter the country. You can see the details here. All things considered, it’s not even a contest. The Dutch are not only friendly, their tech companies – some of the most valuable in the world – are actively recruiting highly skilled internationals. Now, after two years here, with Dispatches Media based in the Netherlands, we can say without fear of contradiction that this isn’t a utopia. There’s a major housing shortage that’s going to get worse before it gets better. That said, the Dutch are building new units quickly … but not fast enough to drive down rents. While the Netherlands isn’t a utopia, it’s as close as we’ve ever experienced having lived in France, Germany and Turkey, and spent a lot of time in the Middle East. The food is great. Healthcare is the best in the world. Schools and universities are world-class and affordable. The transportation grid is the best in Europe. There’s always another fabulous city to visit and there is little or no violence compared to the U.S. In fact, it’s tough to come up with anything that’s not great: For Americans, the difference in work-life balance can also be challenging because business just doesn’t proceed as quickly here as in the U.S. Otherwise, this is the place to be in the 21st century. In most European countries, English is a must career-wise, but it doesn’t take precedence over the local language. Here, English is THE business language. Finally, the Netherlands wins because it has so many lovely (some more than others) cities where you can expect to have a great career and enjoy a high standard of living including Den Haag, Rotterdam, Eindhoven, Groningen, Utrecht, Maastricht, Delft and Twente. Negatives: There is growing discomfort among some Dutch people about the fact the Dutch language and culture are being pushed aside in favor of American culture and English. Almost all university classes are taught in English, for example. The Netherlands is the No.2 food exporter in the world, so food is less expensive here than in other parts of Europe. Fuel is more expensive than in surrounding countries such as Germany, France and Belgium. Rents and housing prices are at or slightly above the European medians even with housing shortages in Amsterdam and other cities. Welcome to the country that scores first place on nearly every education ranking. The international school in Eindhoven is (fairly) affordable and of the highest quality. International schools in Amsterdam and Den Haag are much more expensive. Dutch elementary and secondary schools are super, and the universities and engineering schools here including the University of Amsterdam are in the Top 100 schools in the world. If you’re coming to work at a Dutch firm, HR handles everything. If you’re a DIY expat, there are several straightforward ways of getting long-term residence visa including starting a company, which means putting up a fairly large amount of cash. Virtually no corruption. The Netherlands is ranked just below the Scandinavian countries and Switzerland, according to Transparency International’s Perception Index. Everything is modern, everything works. And people are nice. What else can you want? Just don’t go to Amsterdam in the summer. Crime is an issue in Amsterdam mostly due to shootings related to drug gangs. Petty crime is also a problem in A’dam. But the rest of the Netherlands seems immune. And compared to the U.S., the total homicides in the Netherlands – about 120 in 2017 – total less than one mid-sized city in the U.S. such as Columbus, Ohio, which had 140 that same year. No guns, no problem. About 90 percent of Dutch people are fluent in English. Many speak a third language, most often German. English is the business language, the academic language and even sometimes the bureaucratic language. Compared to less developed countries, taxes are high with the top tax rate about 52 percent. BUT, that pays for the best infrastructure and healthcare in Europe. Bulgaria: We post a lot about Bulgaria, and we see its potential. And friends and family only have great things to say about Varna and Sofia. The economy is also growing and a lot of expat Brits we know are looking closely at Bulgaria as a post-Brexit option. We see Bulgaria on our list sooner rather than later. Maybe 2019 …. Greece: As we worked on an economic-development project, we learned that Athens’ startup scene is really healthy, especially the digital space, with lots of talent. But they need more. Everyone wants to live in Greece and a lucky few such as our Lynne Evans do. But we get the feeling Greece is not quite there yet. Dear undecideds: Are you really willing to live with the reality of a no-deal Brexit?